Last Tuesday I shared that I spend my free time listening to new music, reading about new artists and what’s hot on music blogs. This week’s list was inspired by my girl, BeFit from one of my FAVORITE and FIERCEST of fitness site’s, RATEYOURBURN.COM. Each week Be’ posts an indepth blog on her new fave tunes (some are themed). She has the pulse on what’s new and hot and I love and FULLY appreciate her passion for music! Gotta give props to where my inspiration comes from. Let me know what you think and let me know what YOU’RE listening to this week that’s inspiring YOU to GET FIERCE! Also, if you want to join my FIERCE TRAINING CAMP we kick off our sessions on Saturday, March 23rd! The group maxes out at 12 participants so you get FIERCE personal attention! Learn more about camp or shoot me an email: dyan at GETFIERCETRAINING.com. 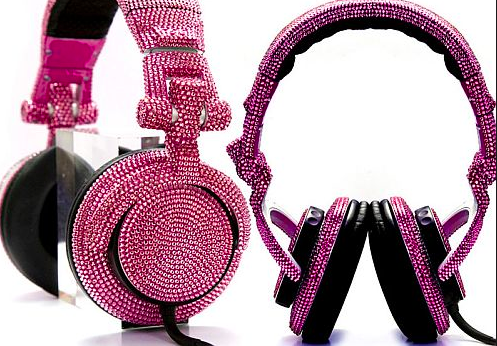 PS – I’m manifesting a pair fo these Swarovski Crystal DJ Headphones! LOVE THEM! This entry was posted in FIERCE FUN, FIERCE SOUL, FIERCE WORKOUTS, FIERCE- ISH and tagged body, dance, fitness, fun, inspiration, love, mental health, motivation, music, running, self improvement, soul by GETFIERCE TRAINING. Bookmark the permalink. Yes please post! I look fwd to checking out your selections! I have another ride as well tonite. Enjoy! !